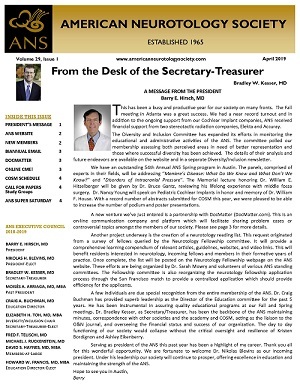 In 2014, the ANS Executive Council approved the creation of a Young Members Group, tasked with addressing the interests and needs of neurotologists in the early portion of their careers. Eligible members include current ANS members, Neurotology Fellow or Trainee member within 8 years of graduation from fellowship (based on the criteria used by the Young Physicians Section of the AAO-HNS) and those currently in fellowship. THE NEXT ANS YOUNG MEMBER EVENT WILL BE HELD IN FALL 2019 IN CONJUNCTION WITH SUPER SATURDAY, SEPTEMBER 14! LAST YEAR'S EVENT WAS A GREAT SUCCESS! This ANS Young members event will follow the “Super Saturday” ANS program. The venue is a 5-minute walk from the Omni Hotel. Eligible members include all ANS Trainee members, otolaryngology residents, neurotology fellows, and ANS Associates and Fellows within 8 years of graduation from fellowship (policy based on criteria from the Young Physicians Section of the AAO-HNS). We hope that you can join us for the cocktails, camaraderie and our panel discussion. Please contact Dr. Cameron Wick, [email protected] for additional details. An e-vite will be sent to eligible members in the coming weeks! ANS Trainee Members- The match cycle has been set up for the 2019/2020 Neurotology fellowship match. Please note that although registration is open up until the rank list deadline, applicants are encouraged to register as early as possible to allow time for application and interviews. ALL rank lists must be submitted by 12:00 PM (noon) PST. After the deadline rank list choices will be locked and no changes can be made. Match results are made available to programs and applicants. Log in to your SF Match account to view match results. Any vacancies which remain after the match will be announced on the Immediate Vacancies page. Contact programs to inquire about vacant positions. Programs are responsible for contacting the SF Match to remove a vacancy once filled. The ANS Trainee membership category was created in 2004 by the ANS Executive Council with hopes that all Neurotology Fellows, Otolaryngology-HNS Residents, and Post Doctorate Researchers would apply for ANS entry-level membership as a full member at the close of his or her training. Trainee membership will co-terminate with the residency/training program at which time the Trainee member will be notified to apply for membership. The following qualifications are required for Trainee Membership in the American Neurotology Society. 1. The candidate shall have earned a Medical Degree of MD, DO, PhD, or the equivalent. 2. In training in a field of study related to the field of Neurotology (Otolaryngology-Head and Neck Surgery Residency, Neurotology Fellowship or post doctoral research position). Please contact the Ashley Eikenberry with any questions.